Sydney based John Bacon and one of his core MC38 and Melges crewmates David Sampson have linked up for their first Melbourne to Osaka Double-Handed Race in 2018, an epic 5,500 nautical mile ocean adventure aboard Bacon’s Class 40. Designed by the French foiling guru Guillame Verdier and built in 2013 by FR Nautisme, the Class 40 was lightly raced in America until Bacon made his purchase late 2016 and had the boat shipped from Newport Rhode Island. 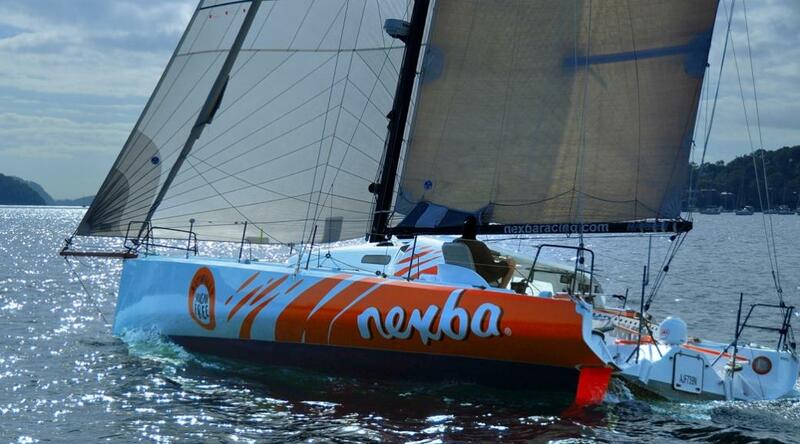 It arrived in Sydney in March and was immediately rebranded in the striking orange of Nexba, the team’s major commercial sugar-free drink partner, and spent time at McConaghy Boats having the systems optimised. The boat was relaunched at Newport’s Royal Prince Alfred Yacht Club in April and with 263 days to the start next March the project team has a busy job list and training timeline to complete before delivering the boat to Melbourne and lining-up for the month-long ocean marathon. The Osaka Race idea first crossed the skipper’s mind a decade ago: “It’s been on my radar for 10 years then when the announcement came out in November 2015 that the race was on again in 2018 I thought maybe I have the time and enough runway to get organised,” Bacon said. So why the Class 40? After weighing up converting an IRC boat Bacon felt he was better off buying something purpose-built and so Sampson headed overseas to follow up potential buys. “We had a look at a 60-footer and in the end we felt it was too ambitious doing our first two-hander in that size boat. During the process I became really interested in the Class 40, which has almost no recognition in Australia. The pair has been working closely with the Australian who has circumnavigated the globe three times under sail, Nick Moloney, and multiple Melbourne to Osaka and Volvo Ocean Race navigator Will Oxley who is coaching them in navigation and weather routing. The duo plan to compete with the minimum six crew in the Cruising Yacht Club of Australia’s July Sydney Gold Coast Yacht Race, then sail two-up for the return leg. On March 1, 2018, the first Melbourne to Osaka start, the slower boats begin their 5,500nm quest, the equivalent of eight back-to-back Sydney Hobart Yacht Races. The next batch head off on March 25, the main start likely to include Nexba, and finally the fastest boats start on April 1. April 25 is the earliest arrival date slated by organisers the Ocean Racing Club of Victoria, Sandringham Yacht Club and Hokko Yacht Club in Osaka, Japan. The race record is held by the 50-footer Wild Thing, skippered in 1995 by Grant Wharington and Scott Gilbert in a time of just under 26 days 21 hours. Nexba takes its name from an Australian brand leading the naturally sugar-free movement, something Bacon and Sampson strongly support. Through their debut Osaka challenge they are also raising awareness and money for the Integrated Disabled Sailing (IDS) program at Nexba’s home club, the RPAYC, and the DEBRA Australia charity which supports families living with the disease Epidermolysis bullosa. While he and Sampson prepare for the approaching adventure Bacon reflects: “We both realise it’s a big event, a long event, and it requires a lot of skills just to get to the start line let alone finish and be competitive. We’ll have to learn when to send the boat and when to look after it; it’s a marathon after all. The Melbourne to Osaka Double-Handed Yacht Race, part of the Sundance Marine Melbourne Osaka Cup 2018, starts off Portsea in Melbourne and takes the competitors into Bass Strait, up the east coast of Australia at some point crossing the East Australian current, into the south-easterly tradewinds then through the Solomon Islands and the doldrums of the equator. It then heads into the north-easterly tradewinds and the equatorial current before fighting the Kuroshio (Japan current), which flows up the Pacific Coast of Japan, and to the finish in the port of Osaka on Japan’s Honshu Island. This is a 5,500 n.m yacht race. The race was first conducted in 1987, starting on the 21st March. It was an initiative of the City and Port of Osaka and the Port of Melbourne, to mark the 125th anniversary of the founding of the Port of Osaka. It was originally intended as a once-only event, but the same organisers ran a further race in 1991. From the 1995 race onwards, the City of Melbourne became involved (in place of Port of Melbourne) in the context of their Sister City relationship with Osaka. Since then, a further four races have been conducted at approximately four-year intervals, the last race was held in 2013. The 2018 event is fully subscribed with a waiting list of keen competitors and events planned between now and the start in March 2018. 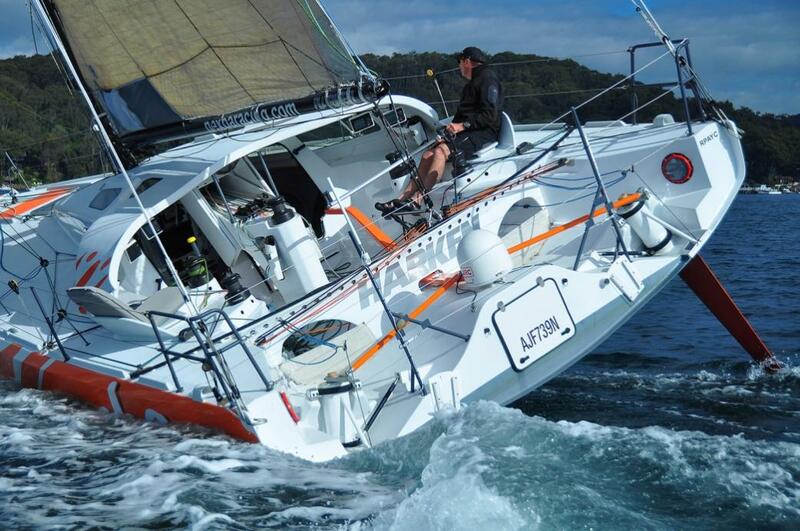 John Bacon's new class 40 short handed water ballasted ocean racer.